i got to thinking about frozen people. got to thinking about folks with no choice about being in the cold. what got me thinking were the folks i was passing as i made my way through the bone-chilling day. the crews cutting down trees, their limbs barely moving as they hoisted their saws in their orange puffy suits. a guy, red-cheeked, frost-bearded, standing in the middle of the road with a pole, measuring something that couldn’t wait ’til a day with bearable temperatures. i thought of the mail carriers, the garbage haulers, the firehose aimers. i thought of the crossing guards, the meter readers, the ruptured water main fixers. i thought of my friend who bundles up like an inuit, she says, and walks 20 minutes to work, her cheeks so numb she probably can’t smile when she gets there, not for a good half an hour. then i really got to thinking about frozen people. i started thinking about dirt man and tax man and refrigerator man. i thought about shorty and squeaky and a guy named everett, who’d built himself a multiplex of boxes up on a platform so the rats couldn’t get in, down in the bowels of the city, down under lower wacker drive. i met the whole civilization of under-street inhabitants a year or so ago, when i tagged along with two saints, named frank and kay fennell. frank and kay do an amazing, uncomplicated thing: they flip open the trunk of their car, they fill it with boxes of home-cooked food, and every thursday night, for 17 years now, they drive down to the depths of the city. they cruise the streets of lower wacker, park, stick their heads around corners, poke behind pillars. they open their trunk, spoon hot food on plates, pour glasses of water. they feed the hungry. and this time of year, they feed the near frozen. you might have heard all the news bulletins. the city is begging the homeless to come in off the streets, off the sidewalks where they stretch out on a pile of flimsy blankets, inch as close as they can to the heating vents at the bases of shimmering towers. well, the folks who call the streets home, aren’t much interested in leaving. they’ve got reasons aplenty why they can’t stand the shelters. and if you ask questions, if you listen, you hear the pain, you hear the fear that keeps them locked where they are. i wrote here the other day that my first instinct when arctic winds hit is to hunker down, to draw into my cave. well, sometimes, i told myself as i thought about frozen people, you need to dig beyond that. sometimes you need to pull up your second instinct. and that’s when i hatched what you might think is a laughable idea. but, heck, this world needs something to laugh about almost as much as it needs something else: the courage of plain old anybodys to get up, to get out of their houses, to walk up to a stranger, a cold, hungry stranger, to hand him or her a brown paper bag, a bag filled with oranges and chocolate and the solid conviction that if we don’t notice the cold hungry stranger, if we don’t let him or her know that he or she isn’t forgotten, we might as well pack it up, call it a day, shut out the lights, sign off the planet. i call it the oranges-and-chocolate brigade. 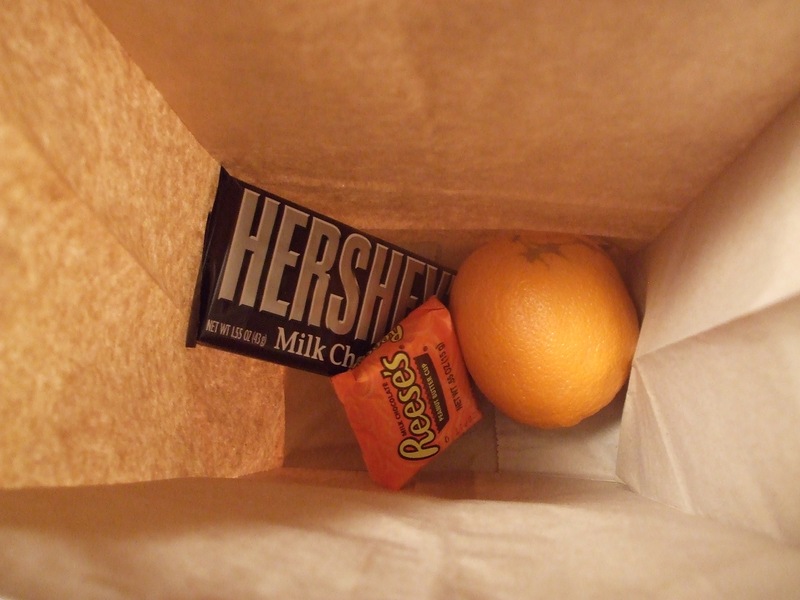 so i went to the store, got oranges and hershey bars, reese’s cups, too. grabbed a stash of brown bags and started to fill. this morning i’m headed down to the bowels of the city, where dirt man and tax man were last seen on the grubby old blankets inside torn cardboard boxes, desperately trying to keep their flesh and their blood at least half alive. 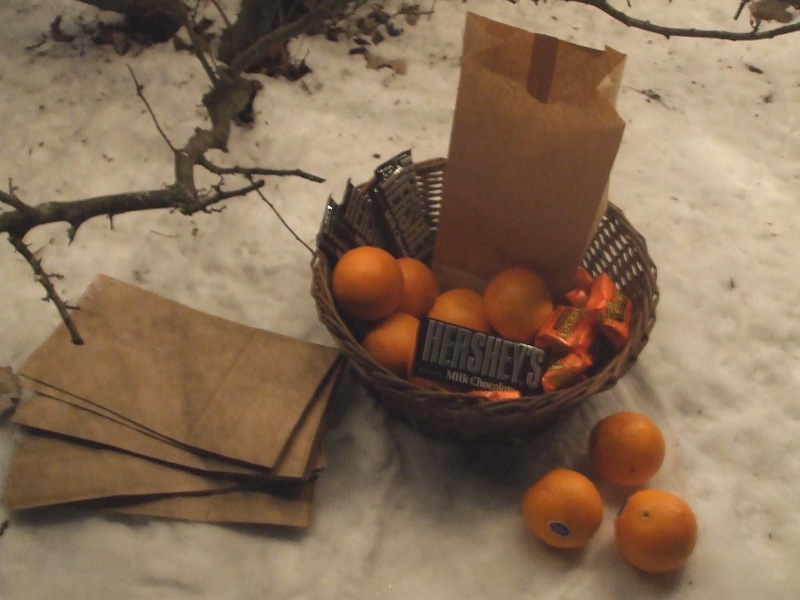 it’s not much, oranges and chocolate in a brown paper bag. but it’s fuel in the cold. and it might be something a little more than that. it might maybe say, in case anyone’s listening, that we will not let the cold and the hungry lay down one more night thinking the world has forgotten, the world has gone cold. that’s a lot to ask of plain oranges and chocolate. but if we don’t ask, who will not wake, frozen, all through? here’s the plot, simply: take a few lunch bags. toss in oranges and chocolate, anything else that you fancy. haul ‘em into your car. you don’t need to drive to the depths of the city to find cold folk. how ‘bout this: when you see someone out working, someone without much of a choice, roll down your window, stop your car. reach out your arm, get out from behind the wheel, even. put your brown bag in his or her hand. smile. say what you will. then go on your way. or bring ‘em home for a hot home-cooked dinner. your choice. always your choice. Another idea: I buy fleece at the fabric store and cut long, soft scarves out of it. Then, I carry the scarves in the car and wrapped them around the necks of Streetwise sellers, Salvation Army bell ringers and even friends I see on the street who look cold. i love that. love that the front seats of our cars can be rolling brigades of whatever is needed. we’re back from our mission, here. and mission humbly accomplished. 12 bags. tucked into shivering hands, tucked under blankets. candy bars torn open with teeth, the better to keep hands under wraps. customer no. 1, as my backseat boy called him, was jimmy, hawking papers where sheridan road meets the crux of lake shore drive. “blessed day,” he invoked, flashing a grin as the light turned to green and we rolled along. customer 2 sat on a plastic tub, under an indian blanket, or maybe a rug, right under the stairs that come down from boul mich at grand avenue. he didn’t utter a word; he just nodded. raked through the bag, honed in on the peanut butter cup. customers 3 through 12 were pathetically easy to find. we kept our eyes keen on the shadows, behind concrete pillars, tucked between dumpsters. once or twice it was hard to tell if there was a someone under the blankets. there was. very cold someones. someones with nose drippings frozen hard on their beards. someones who asked for hot coffee, for sandwiches. i’ll be back, i said. and i meant it. it is so easy, so nakedly humbling, to feed the cold and the hungry, i am ashamed i didn’t start sooner. Okay, here’s the plan. Hot chicken soup in styrofoam cups with lids, chocolate bars, oranges, and maybe even also a polartec wrap because I have some extra fleece lying around (great idea carol). In a bag. Hand them out around the neighborhood tomorrow, when the temp is going down further still. With directions to warming centers and shelters (which of course are by all reports full to bursting even tonight). Maybe a little cash for the bus? I’m only doing six of these things. A tiny fraction of a gesture against the cold, against the absurdity, against the strange, impassive, unfixable injustices of our world. The poor we will always have with us, Jesus said. Maybe he meant we were supposed to have them with us, sometimes, in our homes? At any rate I pray there’s somewhere for everyone to be on five sequential subzero nights…. bam, thanks for the eye-opener, heart-opener. Hmmm. Kitchen tables are for sharing wisdom, right? Well. Here’s a little data, a little experience to share. I did find two–very appreciative–takers today, but with the remaining four bags I experienced something of a packaging disaster. Turns out hot soup melts chocolate bars. And big cold oranges crack the tops of hot soup cups. And soup turns paper bags to pulp. And enough spilled soup turns cardboard boxes to mush. Now the oranges, which I sliced the skins of for easy peeling, have been soaked with the esence of chicken. Sigh. The only thing that survived unscathed was the polartec.Nevertheless I am not daunted. Lent is nearly upon us and if there was ever a time to take an hour (that’s all it took, from start of cooking to finishing delivering) (of course the clean up added an hour or so) out of my week to help a few other folks just a little, then surely the season of repentance, reflection, and fasting is it.Now I just need a little fresh thinking about packaging, etc., and perhaps I can redeem this whole mess for next time….. By the way, any ideas out there for chicken-flavored oranges? might i just add that anon. up above made my heart melt and added weep to my eyes. the image of anon. with chicken-soaked oranges. bus money. polartec fleece. that image will last with me, i think, for forever. God bless anon. and God bless those that she blessed. this is warming me in a way i’ve never been warmed–warmed to tingling, to burning–here on the darn coldest day i’ve felt in years. it is hard to put your head on the pillow such nights, when you close your eyes and see souls huddled under thin blankets, in the bowels of the city that shivers. to anon….for taking the little idea and making it magnificent. i too will adopt her lenten idea. what if there were legions of us, up off our chairs, dashing about the town, where ever we dwell, putting simple sustenance into the hands of the hungry. no committees. no by-laws. just the simple act of brown bags filled with goodness. I must add one more thing. There is an insurmountable wall that separates us from doing things, obvious things, that are charitable or kind. It is built of guilt, helplessness, and fear, as well as the simply overwhelming business of trying to manage our own difficulties.But should you once attempt to climb that wall and take care of another in need nearby, with any small effort, you will find when you have taken that first step, that you’ve actually stepped over the wall, and you will be astounded that it was really just a line all along.Take a step, folks. It feels good.